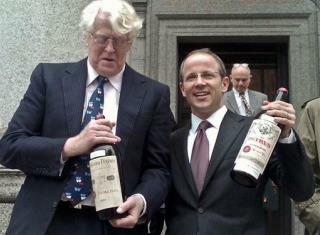 (Newser) – Bill Koch might not be the biggest name among his brothers, but he's got a pretty interesting claim to fame: The collector of fine wine and art discovered he'd bought $400,000 worth of wine that had once belonged to Thomas Jefferson that had, well, never really belonged to Jefferson. So what's a bilked billionaire to do about the fake four bottles in question? If you're Koch, you spend $35 million to figure out who was behind the scam, he tells 60 Minutes in an episode airing Sunday. Not a fan of his brothers so I can say it must be wonderful to have the monetary resources to pursue those that engaged in less than savory business practices. Sad though it cost him so much. Reading below. You would think this guy funded trump. When in reality. They funded people running against trump and the Senate..